The producers of AIVY Vodka - a new, Swedish designer vodka with flavors - predict this to be the new summer hit. Oh, I don't know. But it sure tasted good! It uses the new AIVY Tutti Frutti vodka, which tastes just like a Swedish candy (also called Tutti Frutti). I bet it'd work nicely with any fruit-flavored vodka though, so give it a try! Simply build it in a glass, over ice. Stir and serve with lime. 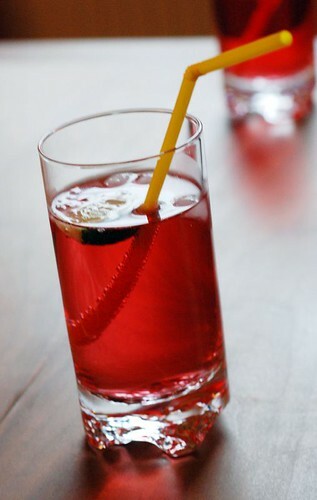 Sounds similar to our current favourite drink - pomegranate juice with vodka & Sprite as well as some pomegranate seeds. It's fun to see the Sprite making the seeds float!! I think I'm just going to start selling vodka with a jolly rancher. You drop it in the bottle and let it sit overnight and you can make your own flavored vodka. This sounds really good! I haven't seen that vodka yet, but I have some cranberry vodka that I think I'll try this with. Thanks!